In just a few weeks on November 4, ballot measures and races with huge transportation implications will be decided at ballot boxes across the country. Some of the notable measures we are keeping an eye on would raise new revenue for transportation at the state or local level, while others redirect existing dollars. We’ll tell you more about each as we approach election day. Bookmark our new page where we’ll be summarizing the issues and tracking the results: Transportation Vote 2014. 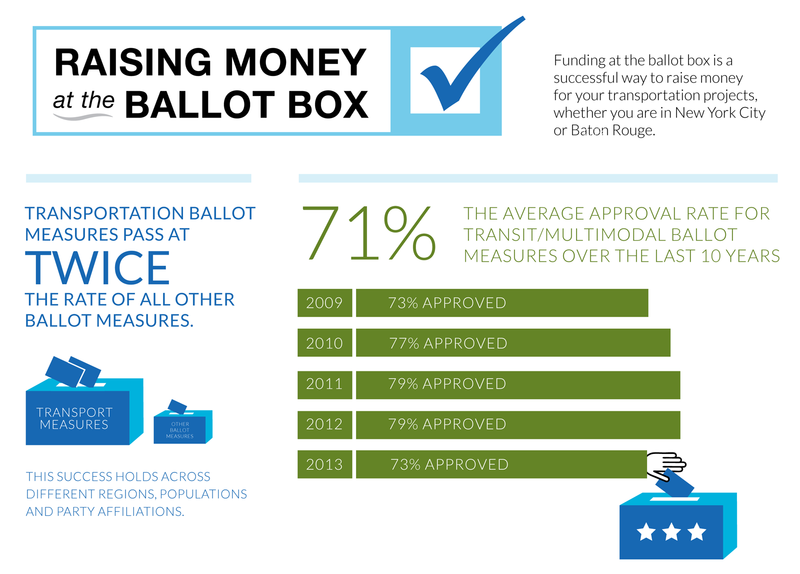 Transportation-related ballot measures tend to do well with voters — whether statewide or exclusively local measures — passing at around twice the rate of all other ballot measures. And transit or multimodal measures always do well, passing about 71 percent of the time since 2009. There’s a handful of notable questions being decided by state and local voters in just a few weeks, and we’ve rounded up the details on the ones we are keeping a close eye on for various reasons. Some are good, some are not so good, but they will all give us useful information about what state and local voters think and feel about transportation investment. One of the most interesting statewide questions is in Massachusetts, where voters will be deciding whether or not to repeal part of the state’s new transportation funds approved just last year by the legislature — one which voters supported at least by implication when all but one of the supportive legislators won their primary election following the vote. And one of the most interesting local issues actually started at the state level as well. After Clayton County’s bus service was cancelled outright in 2010, because of state law, the Georgia state legislature had to pass a law that would allow the County to levy a tax to join MARTA, the Atlanta region’s transit system. That one percent sales tax will be on the ballot in Clayton County on Nov. 4. We’ll have a much more detailed look at both of those issues in the next few days, so bookmark this page and check back here on the blog. As soon as election day is over, the focus will shift to 2015. If you want to know more about state legislation related to transportation revenue, you need to join us in Denver for Capital Ideas. There’s still time to register and make travel plans to meet us there. Don’t miss your opportunity to be a part of this terrific event that will help equip you to make things happen in 2015 and beyond. Hey Irvin, it’s included in the local measures. Click the tab at the top of the list of measures to see those.